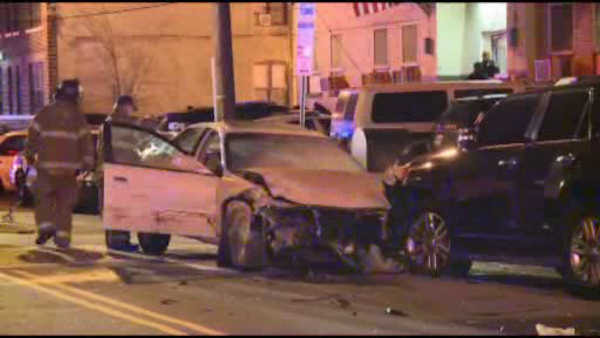 JERSEY CITY, New Jersey (WABC) -- A suspect who stole a car from a Jersey City parking lot tried to get away from police, but ended up crashing in front of a police station. The driver had just stolen the white 2003 Acura from a nearby KFC parking lot. Police officers were attempting to pull over the stolen vehicle when the driver crashed into a police cruiser, injuring one officer. The stolen vehicle continued with a missing tire, striking four other parked vehicles before crashing into an SUV - right in front of the Jersey City South District police precinct. The car's engine then caught fire, forcing the suspect out of the vehicle. The suspect sustained unknown injuries. The injured officer was being treated for neck and back injuries. His injuries were not life threatening.